Two-time ARCA Racing Series presented by Menards winner Gus Dean (@GusDean) will join Young’s Motorsports full-time for the 2019 NASCAR Gander Outdoors Truck Series (NGOTS) season, the Mooresville, N.C.-based team announced this morning at the NASCAR Hall of Fame in Charlotte. Dean, a native of Bluffton, S.C., will compete for Rookie of the Year honors in the No. 12 Chevrolet Silverado. 2018 ARCA Racing Series championship crew chief Jeff Stankiewicz will lead the team’s efforts this season. LG Air Conditioning Technologies will join Dean in his leap to one of NASCAR’s national platforms. LG will support Dean in a primary role for a minimum of eight races, while serving as an associate partner for the entire 23-race schedule. LG Air Conditioning Technologies is a leading player in the global air conditioning market with innovative commercial and residential air conditioners and building management solutions. With a robust lineup of ducted and duct-free products, LG enables contractors to develop the solution that’s perfectly suited for any project. The partnership kicks off with the season-opening NextEra Energy Resources 250 at the Daytona (Fla.) International Speedway on Friday, February 15. Longtime Dean supporter and Jacksonville, Fla.-based, Baker Distributing will continue their support and promote LG Air Conditioning Technologies’ introduction to the NASCAR industry. “We are very happy to continue our longstanding relationship with Gus Dean – while helping facilitate and successfully bring LG Air Conditioning Technologies to NASCAR,” Baker Distributing president Matt Roth said. “This is an unbelievable opportunity,” Dean said. 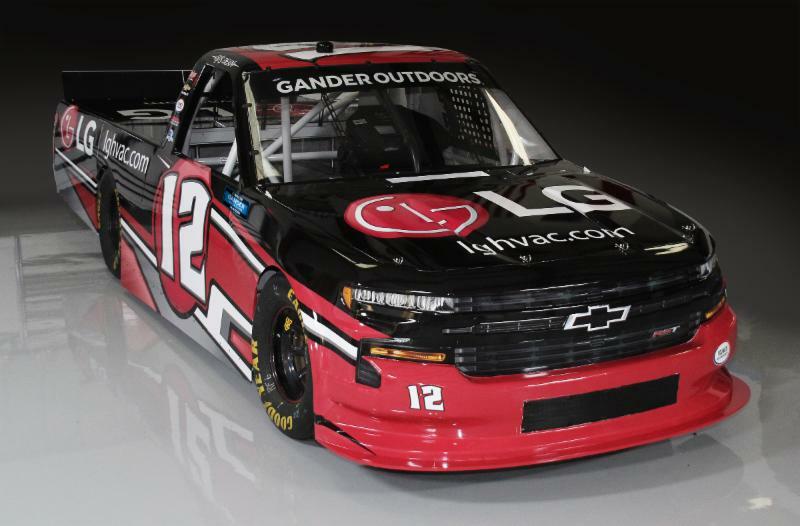 “I’m psyched and very honored to represent LG Air Conditioning Technologies and Young’s Motorsports in my move to the NASCAR Gander Outdoors Truck Series. Without them and the longtime support of Baker Distributing – my dream to be a full-time NASCAR driver would not be possible. Dean, 24, joins Young’s Motorsports on the heels of two full-time seasons in ARCA Racing Series competition competing for Win-Tron Racing. During the 2017-2018 seasons, the South Carolinian earned one win, two poles, 12 top-five and 24 top-10 finishes. Additionally, he earned his first career ARCA Racing Series victory in his second series’ start in a nail-biting finish at the Talladega (Ala.) Superspeedway in 2016 competing for Mason Mitchell Motorsports. Young’s Motorsports team principal Tyler Young says the addition of Dean is destined to strengthen the team’s program in 2019. “I have known Gus Dean for a long time,” sounded Young. “We were fellow competitors in the CARS Pro Cup division and I know his passion to succeed is something that fits well within our organization. “As a team, we are very excited for Gus to climb behind-the-wheel of the No. 12 LG Air Conditioning Technologies Chevrolet Silverado. In addition to competing in the season-opening Truck Series race, Dean will pull triple-duty during Speedweeks 2019 competing in the ARCA Racing Series season-opener at Daytona on February 9 with Win-Tron Racing aboard the No. 32 CAB Installers Chevrolet SS and running select nights during the World Series of Asphalt Stock Car Racing at New Smyrna (Fla.) Speedway in the No. 56 BakerDist.com Super Late Model for Dean Racing.